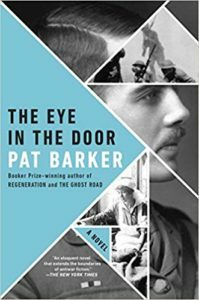 In volume one of Pat Barker’s award winning Regeneration Trilogy, readers experienced life in a hospital for English soldiers suffering from “war neurosis” (PTSD) during WWI. Barker uses both fictional and real historical characters (Siegfried Sassoon, Wilfred Owen, Dr. Rivers) to show the trauma of war for soldiers expected to heal and return to action, and the impact of their experiences upon the doctor treating them. At the end of that novel, Rivers’ patients are being released back to action, which was his goal, but he is questioning whether or not this is right. Sassoon’s anti-war ideas are beginning to have an impact on Rivers, and his health, like his patients’, is suffering. Volume 2, The Eye in the Door, continues to follow Dr. Rivers in his practice outside the Craiglockhart Hospital. Seigfried Sassoon, who had willingly returned to the front despite his anger at the waste of manpower and the lack of stated goals from the government, has returned once again to England, injured and more divided of mind than ever. He struggles with his love of leading his men and his dedication to them on one hand, and his unflagging belief that this war is a waste. He is not a conscientious objector, but his publicly stated opposition to a fruitless war effort means that he is lumped in with them. By this time, 1918, with the war’s end nowhere in site and casualties mounting, the question in governing circles and among the populace in general is why has England not defeated Germany yet? Conscientious objectors had already been a target for anger and vitriol, but in 1918 a new scapegoat enters the picture: homosexuals. A spurious tract has been printed purporting that 47,000 English men and women, because they are “depraved homosexuals,” have been effectively blackmailed by the German government to subvert the war effort. A famous libel case related to charges of homosexuality, the Pemberton Billing trial, has brought this matter to public attention. Friends of Sassoon have been mentioned as part of the 47,000, and Sassoon himself is gay, although that was not widely known. It is in this sort of “witch hunt” environment that the story of Billy Prior unfolds. Prior is another of Rivers’ patients from Craiglockhart who has been discharged from the hospital back to active duty. For health reasons, however, he cannot return to battle and instead works a desk job at the Ministry of Munitions, which is involved in intelligence and espionage. Prior, one of Barker’s fictional characters, was born and raised in the working classes but was able to acquire a good education and become an officer. He knows how to get along with his “betters,” but still harbors resentment toward the upper classes and officer class. His relations with family and childhood friends are equally problematic. On one hand, he values the support he had in his difficult childhood from neighbors such as Beattie Roper and his old friend Mac. Now, though, he finds himself in an uncomfortable position due to their involvement in anti-war protests. Beattie is in prison, having been found guilty of planning to assassinate the Prime Minister, and Mac is on the run for his anti-war activities. Part of Billy resents what they have done, given the suffering he has seen and experienced himself. But part of him cannot forget their importance in his life and will not let him sit by, especially when it appears that Beattie was set up to take a fall for something she never did. Since Billy works at the ministry, he can get access to reports and to the prison where Beattie is held. He also tries to reach out to Mac, but the question is whether Billy can be trusted. Billy has good reason to doubt himself, since he is prone to blackouts where he cannot remember where he has been or what he has done. Is he a Jekyll/Hyde? Why does he black out? Can Dr. Rivers help Prior and himself? Pat Barker’s writing and plots are marvelous. She manages to seamlessly bring together real people and events with fictional, and her understanding of psychology, history and culture is superb. I thought I knew a lot about World War I, but these novels are showing a side that is often left out of history books. The matter of the 47,000, the Pemberton Billings trial, the anti-homosexual hysteria, and the arrest of a woman for supposedly planning the assassination of the PM are all based in fact. Barker’s focus on those who could not or would not conform and on the impact of that nonconformity on the individual and society are a revelation. Share the post "Psychological Conflict Management"
Oooh I think I have these in the backlog of my kindle… I sort of let them slip after reading another story of Pat Barker’s which wasn’t bad but didn’t leave much of an impression, but now these are back on my radar and maybe I’ll have to bump them up my list! I’m on to volume three and can’t wait to see how this all turns out.